After almost two decades of very modest Apartment construction in Pima County, apartment developers have suddenly become very active this past year. 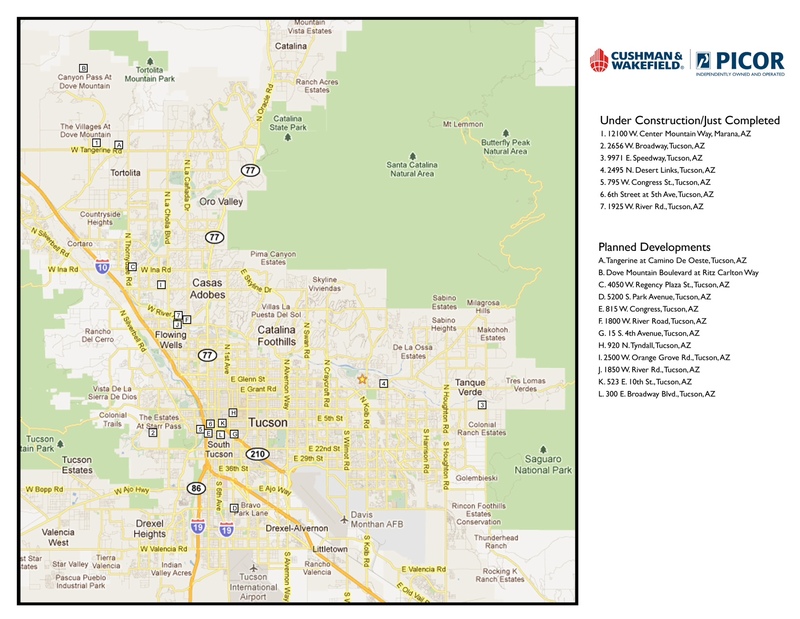 There are currently 7 projects under construction in Pima County and many more planned. Apartments are now one of the few bright spots of local and national commercial real estate development. While it has been well documented that Multifamily is one of the few commercial real estate bright spots nationally what are the particular reasons that Tucson is experiencing a turnaround and a surge in multifamily construction and why does the market feel now is the time to build? In the decade from 2001 to 2010 total new construction in Pima County (of properties 40 units or more) totaled just 4,983 units. Of those 915 units were in income assisted projects and 1,232 units were in purpose built student housing projects, leaving only 2,836 market rate units built in the past decade. This number is much too low for a metropolitan area of 1 million people. The extremely low amount of construction from 1990 through to 2010 has left Tucson with a largely old and outdated stock of apartments. Tucson needs an inventory of newer properties with full amenity packages and modern design to meet the needs of people who do not want to purchase a home such as young professionals, employees and managers being transferred to Tucson, and various other renters who just are not ready to purchase a home particularly given the recent housing bust. This low level of new construction has emanated from a few different factors. First, Tucson rental rates are among the lowest, if not the lowest, of any midsize or large city in the western United States. Extremely low rental rates, particularly during the housing boom, made it extremely difficult for apartment developers to pay the prices for land that other developers of homes, townhomes or just about any other property types could pay. Effectively, apartment developers were priced out of the market except in a very few situations. Second, high impact fees and the slow difficult development process in Tucson slowed some development, limited the number of new projects, and kept some developers away from the market. Much of this has changed allowing multifamily developers to pursue many different development opportunities both in infill locations and in the suburbs. While apartment rental rates have not risen and in fact have fallen in most submarkets (except for in a few very select markets including the University area and Downtown) land costs and construction costs have both fallen substantially. This drop in costs has allowed apartment developers to jump in while home, condo and other developers sit on the sidelines due to lack of demand for new homes, condos, office and retail buildings. The local municipalities have also helped out by making efforts to streamline the development process and shorten the timeline for the development cycle. There are currently 7 apartment properties that are either under construction or have just completed construction and at least another 8 properties which are planned and should break ground in 2012. Of these approximately 15 developments, 3 are student housing projects and one is an income assisted property. The remaining 11 are all market rate apartment properties. Combining these 7 projects along with eight proposed projects there is the potential for the completion of over 2,700 units in 2011, 2012 and 2013 which is over half of the number of units built in the past decade. a) A change in attitudes toward rental vs home ownership due to the recent housing bust – both in middle age families and especially amongst Echo boomers who have witnessed their parents agonize over falling home prices. b) A more difficult lending environment allowing fewer applicants to qualify for a mortgage. d) Urbanization is attracting more people into the city center and along mass transit lines and many individuals will want to rent before buying when they move into the city from their homes in the suburbs. e) Strong demand for more modern student housing walking distance from the University or on the light rail system. Developers appear to also expect many retiree’s and seasonal visitors to opt for a rental unit instead of buying a second home or condominium. This is evidenced by the completion of the 168 unit Legacy at Dove Mountain and two new developments planned in the Dove Mountain area. The new construction is great news for the marketplace and for Tucson. High quality apartments are part of the formula of attracting young professionals to Tucson. The A sector of the rental market is currently the strongest segment and since most new product is considered A quality, the market should be able to absorb the new construction as the economy keeps improving. The new infill developments downtown and near the University will meet very strong demand from students and people wanting to live a more urban lifestyle and near the light rail system. As Americans’ attitudes shift toward renting and a more urban lifestyle, look for more developments to meet this demand. A multi-year top producer with his previous firm, Bob Kaplan, Principal, joined PICOR in 2006 advising on the sale and purchase of multifamily investments serving the needs of local, regional and national apartment owners and investors. Bob also represents buyers and sellers of industrial, office, retail and NNN leased investment real estate. For more information on TREND Report, visit http://trendreportaz.com/ or contact Publisher Lucinda Smedley.